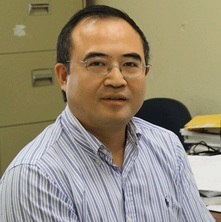 Professor Li obtained his BEng Degree in Environmental Engineering from Tsinghua University (China) in 1988 and his PhD from the University of Western Australia in 1998. His principal research interests lie in mathematical modelling of complex environmental systems. His current work, focusing on processes at the ocean-land interface, has important implications for coastal water resources management and sustainable development. With a large team of researchers from UQ and overseas, he is investigating how fractures develop in coal seams in response to hydraulic fracking, a topic of great interest to the scientific community, coal seam industry and general public. He also has strong interests in field investigation and physical modelling of environmental systems through interactions with experimentalists. In collaboration with scientists from China and UK, he conducted a field investigation on sand dunes in Badain Jaran Desert in the north-west of China. This work (published in Nature) has led to the discovery of a major groundwater system, which could transform the water resources plan in the region. He has published extensively, with over 100 articles in top international journals, and is a regular keynote speaker at international conferences. He is currently Professor and Chair in Environmental Engineering at the University of Queensland. He held visiting professor positions at The University of Edinburgh and EPFL, and is currently holding a prestigious “1000 Talents” visiting professorship at Hohai University. He is currently Editor of Water Science and Engineering, a member of the Editorial Board of Advances in Water Resources and served previously as an Associate Editor of Hydrogeology Journal. Professor Li's research on coastal groundwater dynamics addresses fundamental aspects of ocean-land interactions and has contributed to the development of many emerging concepts and research directions in this field. Until the 1990s very little theoretical research had been done on intertidal groundwater processes at the ocean-land interface. His work, starting from the mid-1990s, has provided a key theoretical base for current scientific view of the dynamics of coastal shallow aquifers, and interactions between aquifers and coastal seas. Traditionally, groundwater hydrologists and water engineers looked at only one side of the issue – the intrusion of seawater into coastal aquifers. Professor Li introduced the community to the other side – the dynamic interaction between seawater intrusion and groundwater outflow to the sea, particularly the environmental impact associated with the interchange. On the other hand, for marine scientists who are interested in the effects of groundwater on mass balance in the ocean, his research established a theoretical framework for assessing submarine groundwater discharge (SGD) and associated chemical input to coastal waters. He developed the first theoretical model of SGD that incorporates oscillating groundwater flow and circulation driven by tides and waves. This work (published in Water Resources Research) has significant influence on current research in the area and has been widely cited. Excessive pumping of groundwater from coastal aquifers has resulted in serious seawater intrusion in the Burdekin Delta area of Northern Queensland. Artificial recharge using waste/rain water has been applied o maintain groundwater levels and hence control saltwater intrusion. This project aims to examine coastal groundwater behaviour under a range of recharge conditions. Parametric study based on an existing model (SUTRA) will be carried out to determine design parameters of optimal artificial recharge schemes, e.g., recharge rate and location. Load cells measuring the total weight of sands and water above a certain level within the seabed may provide an effective way of detecting the changes of the beach profile. The project aims to test this technique in laboratory experiments under a range of conditions (e.g., waves and tides). The overall aim of the study is to assess the potential impact of future groundwater resource development scenarios on selected wetland ecosystems in the Moreton area. Water balance in wetlands is determined by various hydrologic fluxes including surface inflow and outflow, precipitation, evapotranspiration, and exchange between the surface and ground water. The groundwater exchange component may be relatively small; however, it is crucial to the biogeochemical conditions/processes in the wetland because of the typical sharp contrast between the surface water chemistry and groundwater chemistry. For example, groundwater and surface water exchange can alter the mass balance of redox-sensitive solutes in the wetland. To determine the groundwater exchange with the surface water in the wetland [discharge (inflow to the wetland), and/or recharge (outflow from the wetland)] is a difficult and yet important task in studying the impact of groundwater on the wetland ecosystem. The study will be based on analyses of existing data, site inspections and simple modelling. Li, L., Barry, D.A., Jeng, D.-S and Prommer, H (2004). Tidal Dynamics of Groundwater Flow and Contaminant Transport in Coastal Aquifers. In A H-D Cheng and D Ouazar (Ed. ), Coastal Aquifer Management: monitoring, modeling and case studies 1 ed. (pp. 115-142) USA: CRC Press LLC. Li, Ling, Barry, David Andrew, Jeng, Dong-Sheng and Prommer, Henning (2004). Tidal dynamics of groundwater flow and contaminant transport in coastal aquifers. In Alexander H.D. Cheng and Driss Ouazar (Ed. ), Coastal aquifer management - monitoring, modeling, and case studies (pp. 115-142) Boca Raton, FL, United States: CRC Press. Dan, H.-C., Li, L. and Li, L. (2011) Calculation for infiltration rate of flow in cracking asphalt pavement. Harbin Gongye Daxue Xuebao, 43 6: 105-111. Xin, Pei, Jin, Guangqiu and Li, Ling (2009) Modelling of tide induced pore water flow and solute transport in a salt marsh. Shui Kexue Jinzhan, 20 3: 379-384. Observation and analysis of hydrodynamics in a tidal creek at the Chongming Dongtan salt marsh. Xin, Pei, Jin, Guangqiu, Li, Ling and Song, Zhi-yao (2009) Observation and analysis of hydrodynamics in a tidal creek at the Chongming Dongtan salt marsh.. Shui Kexue Jinzhan (Advances in Water Sciences), 20 1: 74-79. Jin, Guang-Qiu and Li, Ling (2008) Advancement in the hyporheic exchange in rivers. Shuikexue Jinzhan/Advances in Water Science, 19 2: 285-293. Xin, P. and Li, L. (2007) Pore-water flow in coastal salt marshes. Shidi Kexue, 5 4: 376-384. Discussion of "Closure to 'Explicit solution to Green and Ampt infiltration equation' by Sergio E. Serrano"
Chen, Juan, Zhuang, Shui-Ying and Li, Ling (2006) Numerical modeling of tide-induced groundwater table fluctuations. Shuili Xuebao/Journal of Hydraulic Engineering, 37 5: 630-633. Ying, Xiao-Ming and Li, Ling (2006) Review on Instream Flow Incremental Methodology (IFIM) and applications. Acta Ecologica Sinica, 26 5: 1567-1573. Liu, X, Mao, XM, Yang, JG, Barry, DA and Li, L (2006) Experiments and modelling of phenanthrene biodegradation in the aqueous phase by a mixed culture. Journal of Environmental Sciences-china, 18 1: 147-153. Jeng, D. S., Mao, X., Enot, P., Barry, D. A., Li, L. and Binlet, A. (2005) Spring-neap tide-induced beach water table fluctuations and its influence on the behaviour of a coastal aquifer adjacent to a low-relief estuary. Research Report - University of Sydney, Department of Civil Engineering, 856: 1-54. Ding, Ling, Pang, Yong, Li, Ling and Gao, Guang (2005) Simulation study on algal dynamics under different hydrodynamic conditions. Acta Ecologica Sinica, 25 8: 1863-1868. Biodegradation of pyrene and phenanthrene in soil using immobilized fungi Fusarium sp. Degradation of phenanthrene and pyrene in soil slurry reactors with immobilized bacteria Zoogloea sp. Comments on "Numerical evaluation of the Lambert W function and application to generation of generalized Gaussian noise with exponent 1/2"
Li, L, Barry, DA, Stagnitti, F, Parlange, JY and Jeng, DS (2002) Comment on "Beach water fluctuations due to spring-neap tides: moving boundary effects." By L. Li, D.A. Barry, F. Stagnitti, J.-Y. Parlange, and D.-S. Jeng - Reply. Advances In Water Resources, 25 5: 586-588. Parlange, J. y., Lockington, D., Sander, G., Hogarth, W. L., Barry, D. A., Li, L., Parlange, M. B. and Govindaraju, R. S. (2001) Comments on "Exact solution for horizontal redistribution by general similarity". Soil Science Society of America Journal, 65 3: 957-961. Li, L. and Li, Z. (2001) The modelling and analysis of resource control of ISCS. Xi Tong Gong Cheng Yu Dian Zi Ji Shu/Systems Engineering and Electronics, 23 2: 48-50. Li, L., Barry, D. A., Stagnitti, F. and Parlange, J. Y. (1999) Tidal along-shore groundwater flow in a coastal aquifer. Environmental Modeling and Assessment, 4 2-3: 179-188. Comment on "Series solution for Richards equation under concentration boundary conditions and uniform initial conditions"
Song, Zhiyao, Zhang, Zhuo and Li, Ling (2010). Quantification of tidal watertable overheight due to the sloping beach in unconfined aquifers. In: , , (). .
Xin, Pei, Jin, Guangiu and Li, Ling (2009). Modelling study on subsurface flows affected by macro-pores in Marsh sediments. In: , , (1394-1400). .
Robinson, C. and Li, L. (2006). Tidal dynamics in a subterranean estuary. In: Proceedings of the 1st Joint SWIM-SWICA Conference. 1st SWIM-SWICA: First International Joint Salt Water Intrusion Conference, Cagliari, Chia Laguna, Italy, (). 24-29 September, 2006. Teo, H. T., Jeng, D. S., Seymour, B. R., Barry, D. A. and Li, L. (2006) Two-dimensional analytical solution for tide-induced watertable fluctuations in a sandy rhythmic coastline. Journal of Coastal Research, 3 39 SPEC. ISSUE: 1665-1670. Jeng, D.-S, Seymour, B R, Barry, D.A., Li, L. and Parlange, J-H (2004). Free surface flow of groundwater: Revisit of shallow water expansion. In: M S Altinakar, S S Y Wang and K P Holz and M Kawahara, Advances in Hydro-Science and-Engineering. Advances in Hydro-Science and-Engineering, Brisbane, Australia, (1-10). 31 May - June 3, 2004. Robinson, C. E. and Li, L. (2004). Laboratory investigations on water exchange and mixing processes in a coastal aquifer. In: M S Altinakar, S S Y Wang and K P Holz and M Kawahara, Advances in Hydro-Science and-Engineering. Advances in Hydro-Science and-Engineering, Brisbane, Australia, (1-9). 31 May - June 3, 2004. Cartwright, N. B., Nielsen, P. and Li, L. (2004). Watertable Wave Dispersion in Sandy Coastal Aquifers. In: M. S. Altinakar, S. S. Y. Wang, K. P. Holz and M. Kawahara, Advances in Hydro-Science and-Engineering. Advances in Hydro-Science and-Engineering, Brisbane, QLD, Australia, (1-10). 31 May - June 3 2004. Jeng, D. S., Teo, H. T., Barry, D. A. and Li, L. (2003). Analytical Approximation for Tidal Dynamics in Coastal Aquifers. In: Proceedings of the Thirteenth (2003) International Offshore and Polar Engineering Conference, , , (2215-2222). May 25, 2002-May 30, 2003. Jeng, DS, Teo, HT, Barry, DA and Li, L (2003). Analytical approximation for tidal dynamics in coastal aquifers. In: Chung, JS, Wardenier, J, Frederking, RMW and Koterayama, W, Proceedings of the Thirteenth (2003) International Offshore and Polar Engineering Conference, Vol 3. 13th International Offshore and Polar Engineering Conference (ISOPE-2003), Honolulu Hi, (870-877). May 25-30, 2003. Jeng, D. S., Seymour, B. R., Teo, H. T., Barry, D. A. and Li, L. (2003). New approximation for tide-induced water table fluctuations at a sloping beach. In: Modsim 2003: International Congress On Modelling and Simulation, Vols 1-4. International Congress on Modelling and Simulation, Townsville, Australia, (260-265). 14-17 July 2003. Cartwright, N. B., Nielsen, P., Li, L. and Callaghan, D. P. (2003). Watertable Waves in Unconfined Aquifers: Sloping Boundary Effects. In: 16th Australasian Coastal and Ocean Engineering Conference. Coasts and Ports Australasian Conference 2003, Auckland, New Zealand, (1-9). 9-12 September 2003. Li, L. and Barry, D. A. (2001). Groundwater effects on sediment transport: A modelling study of the mechanisms underlying beach dewatering for erosion control. In: Li, G, Hydraulics of rivers, water works and machinery vol. II : proceedings of Theme D. 29th Annual Congress of the International Association of Hydraulic Engineering and Research (IAHR), Beijing China, (294-305). 16-21 September 2001. Barry, D. A., Bajracharya, K. and Li, L. (1994). Velocity scaling of nonequilibrium solute transport in heterogeneous soils: numerical and experimental results. In: Proceedings of the Water Down Under 1994 Conference. Part 3 (of 3), , , (). November 21, 1994-November 25, 1994. Barry, D. A. and Li, L. (1994). Physical basis of nonequilibrium solute transport in soil. In: Etchevers, JD, 15th World Congress of Soil Science, Transactions. 15th World Congress of Soil Science, Acapulco, Mexico, (86-105). 10-16 July 1994. Li, L., Barry, D. A., Hensley, P. J. and Bajracharya, K. A. (1993). Nonreactive chemical transport in structured soil: the potential for centrifugal modelling. In: Robin Fell, Tony Phillips and Charles Gerrard, Geotechnical management of waste and contamination: Proceedings of the Conference on Geotechnical Management of Waste and Contamination 1993. Conference on Geotechnical Management of Waste and Contamination 1993, Sydney, Australia, (425-431). 22-23 March 1993. Significance of Surface Water and Ground Water Discharges of Nutrients from Resort Islands of the Great Barrier Reef. The overall aim of the study is to assess the potential impact of future groundwater resource development scenarios on selected stream ecosystems in the Moreton area. Groundwater interacts with streams through exchange within an area known as the hyporheic zone – a diffuse region that forms the boundary between the stream channel and the adjacent groundwater system. Hyporheic exchange affects the quantity of water in the stream. In addition, the exchange modifies the stream water chemistry. Chemicals dissolved in the water, such as nutrients and pesticides, may undergo significant biogeochemical transformations within the hyporheic zone. To develop a linkage between the groundwater and the stream ecology, it is important to identify the mode of surface water and groundwater interaction (i.e., gaining, losing or perched stream), delineate the hyporheic zones, and determine the hyporheic exchange fluxes (including water and dissolved chemicals). This study will be based on analyses of existing data, site inspections and simple modelling.